Reading an article in the Toastmasters magazine, Joel Schwartzberg, talked about getting to the point. It made a lot of sense. Some of it goes against our Southern conversation skills, but it made sense. He needed to make a point. A point is a statement that you can defend and prove with reasoning. “Because I said so” does no count in the proof and reasoning section, by the way. The article went on to give five questions you need to ask yourself to make sure you’re making a good point with your presentation. First, do you believe it? The author says to “place the words ‘I believe that’ in front of what you think is your point and see if your statement is grammatically correct. If it is indeed a complete thought, you’re well on your way to a real point. If not, rewrite the statement until it would satisfy your middle school English teacher. These three words force you to commit to a contention and make an argument for it. “The ‘I believe that’ test is helpful for emails, job interviews, pitches, performance reviews – any situation in which you’re trying to make an impact. “Is it a truism? If your point is instantly true (Ice cream is delicious), dig deeper to find a point you can argue. (Soft serve ice cream is the most convenient summertime dessert.) One way to root out a truism is to follow up the point by asking yourself ‘why?’. It it’s a truism, there won’t be much of an answer. It answers itself.” Your point needs to have a reasonable opposite point of view. “Am I jamming too many ideas into my point? If you have multiple thoughts or adjectives to convey, don’t jam them into a single point like clowns into a Volkswagen. Pick the most important one, focus on it and bring up the other later, one at a time. It may seem like you add value to your point when you add new words and ideas, but when you throw multiple point at an audience in a single sentence, you actually dilute the impact of each one. The audience is not only forced to split their attention between multiple points, but is left clueless as to which idea is more relevant. “Am I using ‘badjectives’? B adjectives are adjectives so broad that they convey no value. They’re deceptive because they seem to project a clear impression. Who wouldn’t want to be connected to something ‘excellent,’ ‘fantastic,’ ‘terrific,’ or ‘very good’? “But being general robs your point of substance. What does it really mean to call something ‘great’? What makes it great? The audience has no idea. Using badjectives is like when a Little League baseball coach says, ‘Come on now, Johnnie!’ versus ‘Keep your eye on the ball as it comes to you, Johnnie!’ One has no value, but the other makes a substantive point. “Dig for words that say what you truly mean. “Can I speak about this for more than a minute? Chances are if you can’t, your response does not have much of a point. Without a point, you have nothing of value, you’re pointless. But armed with a strong point, you present to your audience an idea they can digest, take home, and even benefit from. Let’s focus on the Heritage Community Annual Easter Egg Hunt at 2 pm on Mar. 30. And, let me point this out – the hunt is for the children, parents, not for you. Stand back behind the line and let your kids learn to be a little independent. They don’t have to find all the eggs, they just should be having fun. To hush up and stand back. Did I make my point clear? It’s Easter weekend. I hope that the weekend has in it all the things that you would wish. Maybe attending church is a part of your Easter weekend. Maybe you have thought about it but don’t know where to go. Victory Center is a Main Street Guymon member. 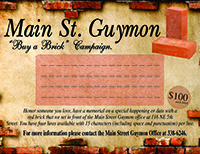 Yep, they pay their dues and support what Main Street Guymon does in the community. It would be a good idea to give them a chance to be your home church, if you don’t have one, in my opinion. Shop and Dine is Apr. 5 starting at 4 pm. Check out the fun downtown happening in the Shop and Dine. And I’ll make it a point to wave at you when you’re on the bricks!